Updated Sunday January 7, 2018 by Kitchener Sports Association. 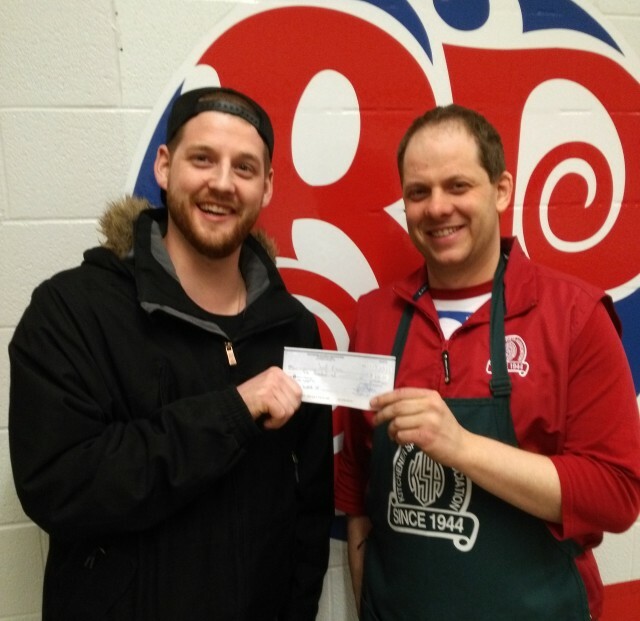 PHOTO: The winner of the KSA 50/50 draw at the KW Titans game on March 11, 2017, Joel Bisson, accepts his $600 cheque from seller Robert Lanteigne. A 50/50 draw was held at all KW Titans home games throughout the season and playoffs. Proceeds from the draws are used to support local minor athletes, sports groups, and charities. Welcome Titans and basketball fans! Special thanks go to all the volunteer sellers for their efforts and to the KW Titans for allowing us to be part of their home-game events during their inaugural season. The needs of the local sporting community continue to escalate so we appreciate the opportunity to seek additional support from local basketball fans at the games. Thanks for supporting our draw and congratulations to those fortunate enough to share the proceeds! See where the money has gone over the years. Specifics on the KSA 50/50 draw at the KW Titans games. Ticket prices were $2 each, 3 for $5, or 7 for $10 with each ticket perforated to yield 3 separate draw entries each with its own individual chance to win. Tickets were sold before each Titans home game until just before the end of the half-time intermission (unless sold out prior to then). The winning number was drawn during the early part of the third quarter and announced from the public address system at the Kitchener Auditorium. Under section 5.2.1 (f) of the Ontario Lottery Licensing Manual, the purchaser had to be present at the draw in order to collect his or her prize. Photos of some of the recent 50/50 draw winners. If you have a winning ticket you have to claim your prize during the game at the location announced within the announced time-frame. To minimize delay, please ask for assistance if uncertain where to claim your prize or how best to get there. You must have the actual stub, and submit it, to claim the prize. In case of clerical error, the official number(s) as announced at the Titans game are the only one(s) for which prize(s) will be awarded. This listing is historical. In compliance with regulations and in an effort to ensure that each prize is claimed, specific claiming procedures must be followed. The official claiming procedure is announced at each game and involves a defined time-frame (approximately 12 minutes on the game clock), commencing when the winning number is announced at the start of the 3rd quarter, during which the prize must be claimed. If no one presents the winning ticket within the allocated time then a new "winning" number will be drawn (thereby voiding the previous number) with a new claiming time-frame. This notice is only a guideline as details announced at a specific game govern that draw.